From 1936 to 1958, Buick's Special model range represented the marque's entry level full-size automobile. 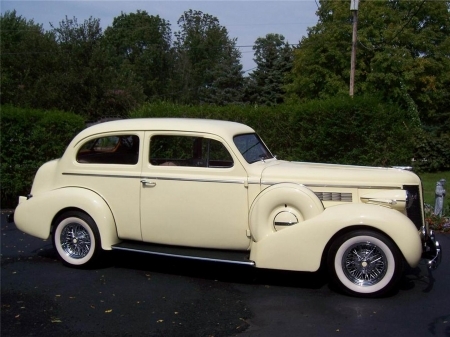 The '36 was a very successful year for Buick and also marked the first time of using names rather than the simple serial numbers which had been in use before. The Special continued to also be known as the 40-series, however. The first Specials rode on a 118 in (3.0 m) wheelbase, but for the next model year this was increased to 122 in (3.10 m) as all Buicks grew for that year. The engine was also new, and was now of 248 cu in (4.1 L) rather than 233 cu in (3.8 L). The Special (and all other Buicks as well) underwent a full restyling for 1939, with a more enclosed nose and a wider grille. The wheelbase was also two inches shorter. For 1940, there was the usual restyle and the wheelbase increased by an inch. This was also the only model year that a four-door convertible Special ("Sport Phaeton") was offered, although only 552 were built.